The 23andMe DNA results are in! The results were uploaded to my 23andMe profile today. I posted/registered the sample from the UK, nine weeks ago. The sample traveled to the USA lab via a NL holding depot. It took six weeks to process the sample and results, from the time of being marked as arriving at the USA lab. I feel very fortunate, as many 23andMe customers are reporting a seasonal log-jam that is delaying the process. My results though were comfortably within the proposed time frame. There were a number of pleasant surprises. The results were far from boring. On the health side that we UK customers can presently still enjoy - there was only good news. Although I have a family history of Alzheimer's that is strong on my father's side, there was no identification of any genes in my DNA, that have so far been associated with increased risk of the illness. If my father did have these genes, I didn't receive them. It does not mean that I will never be at risk to the illness, but it gives me some comfort. Indeed, all of my 23andMe genetic risk factors were good. There was no bad news. An amusing little trait, that IS identified by the DNA analysis, is on Asparagus Metabolite Detection. When I eat asparagus, my urine smells strongly. It confirms for me - that the system works! It also correctly identifies that I have a sweet tooth, that I have blue eyes, etc. Now to the genetic genealogy goodies. The genetic marker that I inherit from my strictly paternal lineage - father's father, father, and so on, going back. On paper, I've traced this back to a John Brooker, that lived in Oxfordshire, but was born outside of that county, perhaps in nearby Berkshire, circa 1785. Of course, that is if no-one ever lied in forms over who the father was. This one was a shocker. A little background first. Although my paper ancestry over the past 350 years is overwhelmingly localised in parts of the county of Norfolk, in East Anglia, my paternal-line surname carrier, that should be the donor of my Y chromosome marker, or Y-DNA, can be traced to Oxfordshire, in Wessex. Out of my eight paper great grandparents, seven were Norfolk born and bred. However, the exception was my paternal great grandfather. Therefore I would not expect my Y-DNA to belong to any local Norfolk gene-pool. It is the least representative lineage for my heritage. This is why I feel that people can sometimes place too much value on their haplogroups. I did however, expect it to belong to a common English or British haplogroup such as the Y-DNA R1b group. I was in for a surprise. It is exotic L2*. From initial research including an Internet search, this haplogroup forms only a rare back scatter across Europe. It appears more commonly across Western Asia and the Sub-Continent, from Turkey to Southern India. It is most common in Pakistan, where it may originate, circa 30,000 years ago. It is not a common European Y-DNA haplogroup. I need to more carefully research this in the near future, but I'm in awe to find that I have an exotic Y-DNA. It does conjure up images of one of my paternal ancestors being a Syrian archer, or Persian mercenary in the Roman Army, fathering a child, while stationed in Britannia, or perhaps elsewhere in Roman Europe. But that might be too fanciful. Anyway, I'm having pheasant curry for dinner tonight. This genetic marker should be shared with my son, and my brother. A few of my first cousins will also have it. The genetic marker that I inherit from my strictly maternal lineage - mother's mother, mother and so on back. On paper, I've traced it back to a Mary Page, who was born in 1802, in Norfolk. I like the maternal line, as it is actually the most biologically secure. Few forms lie about who the mother is. 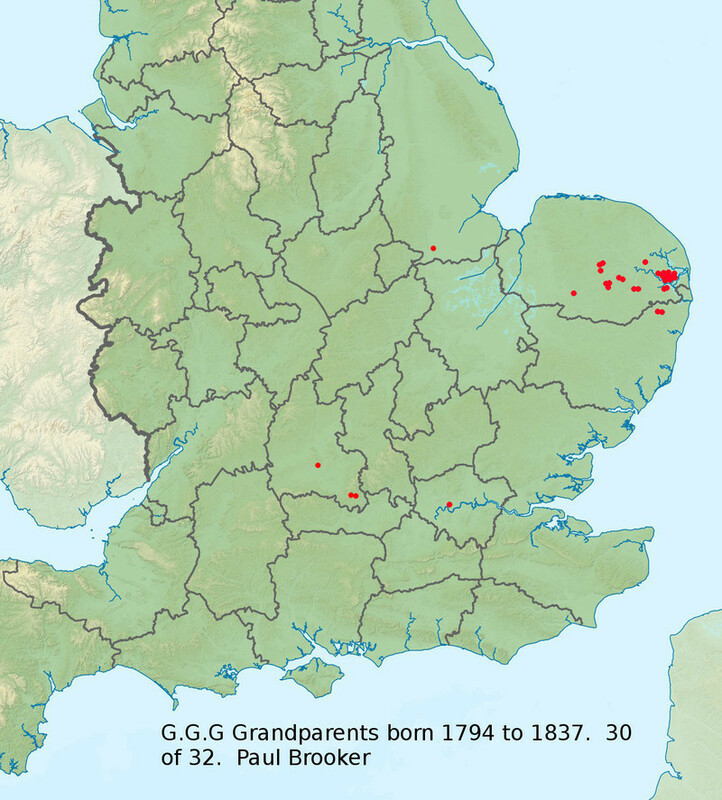 I'd expect my mt-DNA to be a haplogroup firmly established in East Anglia. A nice one to have. It is H6a1. This haplogroup belongs to the Helena group. However, it is not ancient European. H6 is believed to have mutated from H around 30,000 years ago in Central Asia. H6a1 has recently been associated with the Yamnaya migration into Western Europe, from the Eurasian Steppes to the north of the Black Sea, some 4,000 to 5,500 years ago. In Europe itself, it could be associated with a number of Early Bronze Age cultures, the Corded Ware culture. It has been linked with the R1b Y haplogroup, that dominates Western European countries such as Ireland, France, and the British Isles. Recent studies have indeed suggested a significant displacement of people in Western Europe, that occurred in late prehistory, with the arrival of pastoralists from Eurasia. This migration is also associated with the rise of the dominant Indo-European linguistic group of Europe. If H6a1 does indeed prove to be linked to the Indo-European explosion of the early Bronze Age, I'd be very happy. I like to imagine one of my maternal ancestors 5,500 years ago, accompanying a band of prehistoric pastoralists, that are heading westwards into Europe with their horses. This genetic marker will be shared with my mother, my brother, my sisters, and their children. A few cousins will also share it. This is an area that I've been trying to understand recently. It uses computer analysis, to compare my autosome DNA to a number of others in reference populations from around the World, which then composes suggested ancestry in percentages. This magic attempts to look not at a few genetic markers or haplogroups, but at all of the patterns in my autosomal DNA, to predict likely ancestry on any lineages that survive in my DNA. Previous to receiving my results, I recently revised and bolstered up my paper genealogy based family tree, I now have 172 direct ancestors listed, going back to Generation 14 during the 17th Century. I noted that all, and everyone of my paper recorded ancestors were English. All of them. That includes all of my eight grandparents, all of my sixteen great great grandparents, and thirty of my thirty two great great great grandparents. That is 100% English. Now, I'm sure that you'd agree, I should be expecting my 23andMe ancestry composition to give 100% English, right? Well no. They can't presently identify an ethnic group like the English. Instead, I should expect my results to fall 100% into the British & Irish category. 100% British & Irish? No, I'll give this one early. it was 32% British & Irish on speculative mode. More on this further down. My paper research before I received my results also revealed just how concentrated, most of my ancestry has been over the past 350 years. I compiled the below map of East Anglia. The BLUE marking the places of ancestral events from my family tree on my father's side; and the RED marking the places of ancestral events on my mother's side. The larger the marker, the more events recorded. 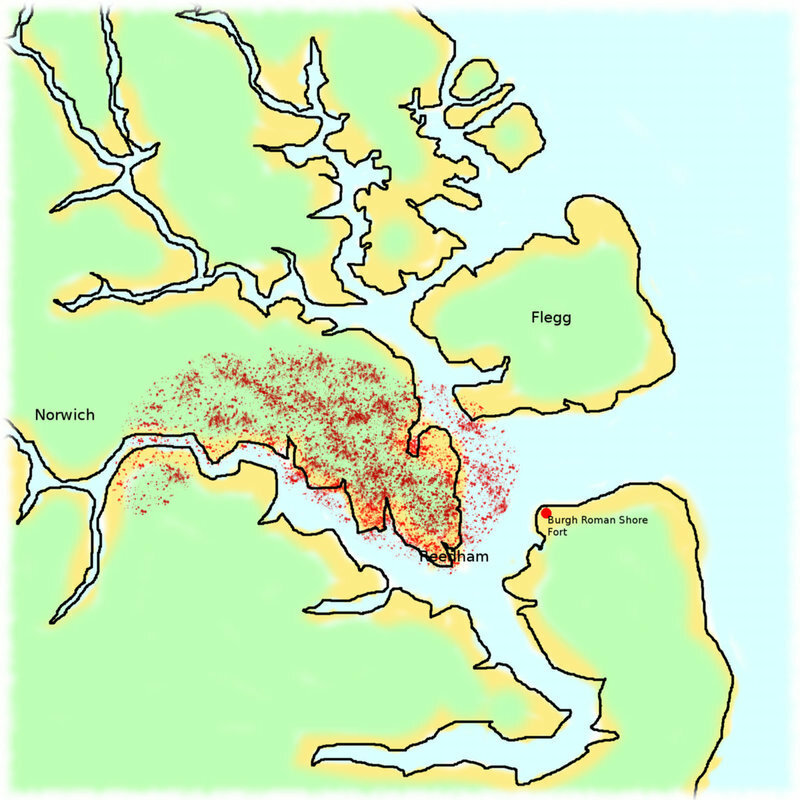 I also made a map based on East Norfolk during the 4th Century AD, before sea levels fell, and drainage changed the coastline. I then marked out the area of my mother's ancestry on that. The point that I was trying to make was that I believe that my ancestry may have been more exposed to the North Sea Immigration waves of the 4th to 11th centuries AD. More exposed than your average person of British & Irish heritage. 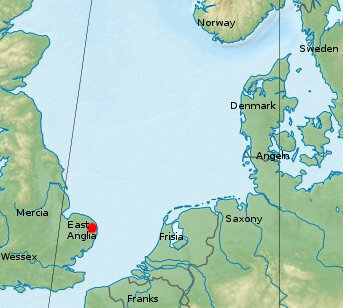 I also suggested that East Anglia, very much a part of the North Sea World, was particularly attractive to Early Medieval migrants from Frisia, Schleswig-Holsten / Angeln, North Saxony, and from Denmark. People of Irish heritage, or even Americans with either Irish or British ancestry, tend to score a higher percentage of British & Irish than do the present day ethnic English. 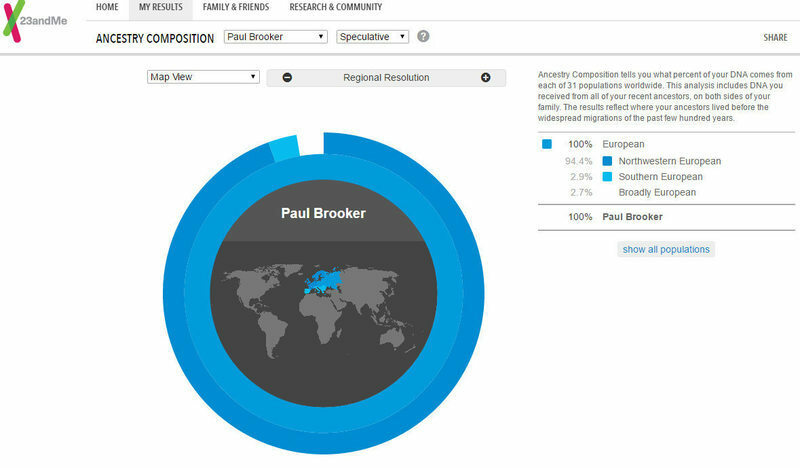 23andMe has a generous and growing reference population in it's British & Irish database. However I hypothesised that 1) the 23andMe B&I reference is skewed to the Irish, and away from English. It is also possible that it is distorted by a case of genetic drift by testing Americans of British origin. 2) that the British & Irish designation may actually be inadvertently looking at DNA that arrived in the British Isles largely previous to the early medieval North Sea migrations. To the British and Irish genes that have been here since late prehistory. On the other hand, the French & German, the Scandinavian, and perhaps some of the undesignated Broadly NW European percentages that are usually assigned to the ethnic English, may actually reflect early medieval migration from across the North Sea. The computer analysis is simply unable to distinguish some of the DNA from that of present day French, Germans, or Scandinavians, because of ancient admixture. I'm told that this would not be the case, that 23andMe ancestral composition could not detect such deep, ancient admixture. However, what if I am correct about my own heritage - that I likely have enhanced levels of Anglo-Saxon and perhaps Norse heritage, because of the geographical location of so many of my ancestors? Should I not expect even lower percentage of the 23andMe British & Irish category, and even higher percentages of other NW Europeans from across the North Sea? So what was my 23andMe ancestry composition percentages (speculative mode)? Oh my goodness. It correctly fits my prediction. I have more than double the average percentage of F&G and Scand for English people. Despite having a paper researched genealogy that is 100% English, 23andMe's ancestry composition based on a generous reference sample size of 1251 sets, gives me 32% British & Irish. So a predicted, but still incredibly exciting result. I'm chuffed to bits. It does in my eyes, blow 23andMe's British & Irish designation out of the water though. Their reference samples do not appear to match the East English. Instead, their software misreads some of the English DNA for French & German, or Scandinavian. I'm suggesting that this is because of ancient admixture, during the 4th to 11th centuries AD, with North Sea immigration. I invite others to knock my suggestion down. This looks real. It appears that I have a small percentage of South European heritage. Most likely from Spain, Portugal, or Basque. I probably have Iberian ancestry that I have not yet detected using paper genealogy. Either that, or it's an anomaly, a incorrect interpretation. Finally, how much Neanderthal DNA do I have? How much of my DNA was shared by the archaic humans that lived across parts of Eurasia, between 350,000 to 30,000 years ago? Evidence of early admixture events between Neanderthal and anatomically modern human populations? That's just slightly above the average of 2.7% for modern Europeans. So I am not more Neanderthal than most others. Sorry to disappoint. All in all, very happy that I spent the money.